Welcome to the second episode of the MuscleCast video podcast. 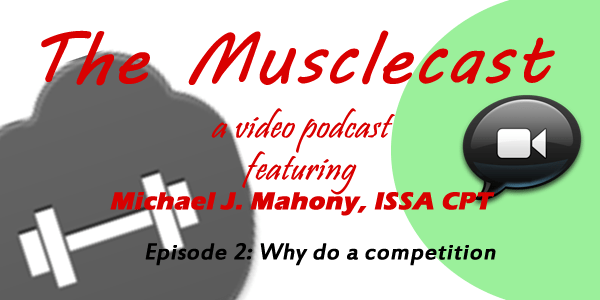 In this episode I discuss the reasons that people might want to enter physique competitions. The first thing we need to clarify is what I am talking about. Many people hear “bodybuilding competition” and immediately shy away (especially women) because they are afraid to “get too big.” When I say “physique competition” I am referring to women's divisions such as bodybuilding, figure, physique and bikini, and men's divisions such as bodybuilding and physique. Why would anyone want to compete? When I entered my first competition it was to give myself a great reason to lose a lot of weight. I told everyone I knew that I was going up on stage fat or in shape. It was a motivator to get into shape and there was a hard cut off date for that happening. Maybe this would help you? Others just like to get into and stay in shape. Competitions will do that for you. In addition you meet some very amazing people. Some of the nicest people I know are part of this industry. Be warned that this is not for whiners and complainers. Bodybuilding preparation requires some major focus. There is a tiny bit of suffering. You will cut your carbs low for at least 12 weeks. You will train with massive intensity. You will do whatever it takes to get the fat off your body. It will mess with your energy, make you extremely tired and fog up your brain. These are all reasons why a whiner need not do this type of thing. I found it a very rewarding and eye opening experience. I will warn you that you will be faced with a choice to take drugs or not. In my opinion, that's your personal decision. I would not look down on you for deciding to take the drugs. It gives you an edge you just might need. Welcome to Musclecast Episode #1. This episode is all about regaining focus. Sometimes life throws us a curve ball and we fall off the wagon. The important thing is to pick ourselves back up and get to work regaining focus. It can be difficult unless you do it consciously. To me regaining focus means some planning. Everything I do seems to involve planning. Regaining focus means realizing that you have to keep it simple. You shouldn't try new things while trying to regain lost focus. Instead, focus on what you know has always worked for you. It is the best way to make some progress and making progress will help you to keep your focus. Listen to the video to find out more. Get That Mental Edge Now!